When I read the post, Should your social media strategy follow the 4-1-1 rule?, it reminded me of the guideline that I often share when people ask me about the best approach to posting content on social media. In the 4-1-1 Rule, it was asserted that for every 1 self-serving post on a social platform, the brand/individual/organisation, should share 4 pieces of original content and 1 re-share. While I really commend this approach, I’m not sure if this would work across the board. I guess, it depends on what constitutes “original content” and what is the primary aim of the brand/individual/organisation in a specific platform. + is all other “value adds”, like using #FollowFriday (#FF) hash tags and Paper.li posts on Twitter or allowing wall posts from others on Facebook. While these are great things to have, I believe these should never overrun your stream. And, no, I don’t see 5 as ‘The Magic Number’. This is really just a random number that I’ve used. It doesn’t even have to be totally equal. Really, the general idea is just to make sure that your social media account doesn’t look like a pulpit (where you just broadcast information all the time), a rehash (where you just share information that may be found elsewhere), or a clique (where everything appears to be private conversations being held in public). So, there needs to be a balance of content that comes out of your social accounts. Whatever number or ratio you decide to choose, it’s important to show that your social platform may be seen as a great resource for original content, with a personable voice, and one that knows how to promote others and engage. What about you? 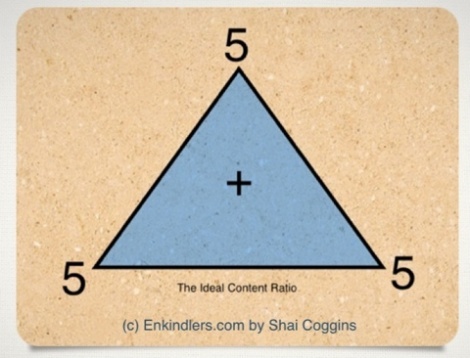 What’s your ideal content sharing ratio?